Even though FOOD takes up the majority of my thoughts each day, there are days/nights that I space on meal planning or food shopping. So keeping canned salmon in the house ensures that I can quickly put a nutrient dense food on the table for all of us. This recipe makes 8 small salmon patties. Eat them all up, keep in fridge for a few days, or freeze (after cooking) for another time! Directions: Mash all ingredients together well. If batter is too runny, add 1 more tablespoon of coconut flour. Spoon out about 8 small balls onto a sheet of parchment paper (for easy clean up) or plate, then use clean hands to form into patties. Heat cooking pan on medium/high heat and add butter or oil. When hot, cook patties about 3-4 minutes each side. Serve with side of veggies and rice or quinoa. Top cakes with dressing of your choice or simply Sir Kensington‘s mayo with a squeeze of lemon! 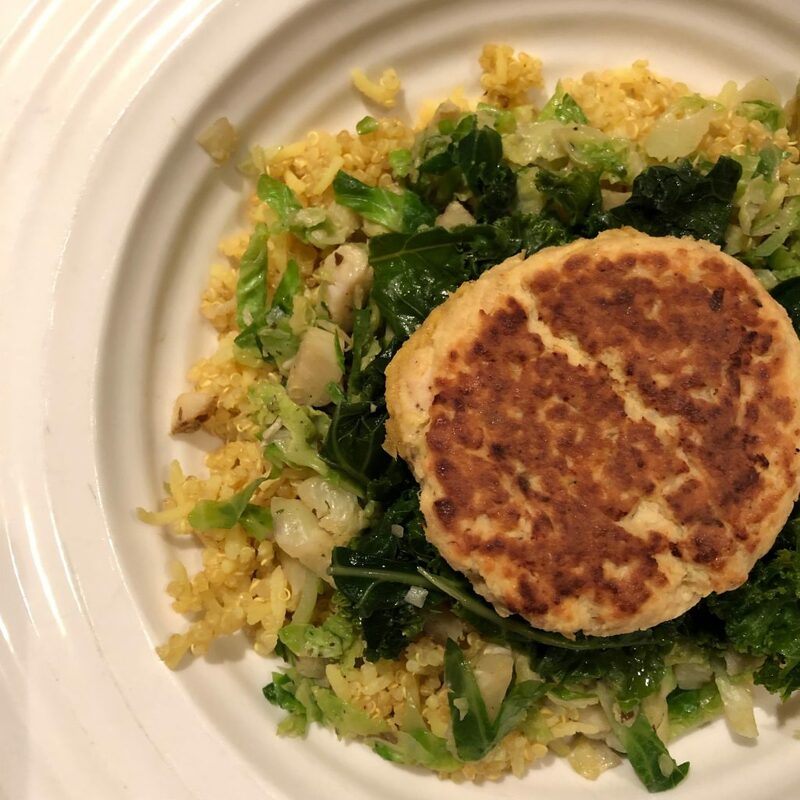 In my picture I placed my salmon cakes over other foods I had meal prepped that week. I boiled up some white basmati rice and quinoa with turmeric and spices, sauteed/steamed shaved Brussels sprouts in ghee and spices, and cooked kale in bone broth with sea salt. I topped it all with Trader Joe’s vegan Almond Butter Turmeric Dressing. It looks fancy, but it’s NOT! *Not all canned salmon is safe/OK to consume: First, make sure the label indicates that the salmon you’re buying is either Alaskan pink salmon, sockeye, or red salmon. All of those terms indicate that your salmon is wild fish from North American waters. The Alaskan salmon fishery is one of the most well-managed, safe, and sustainable fisheries in the world, so as long as your salmon is wild-caught, it’s almost always an ethical choice on all fronts.